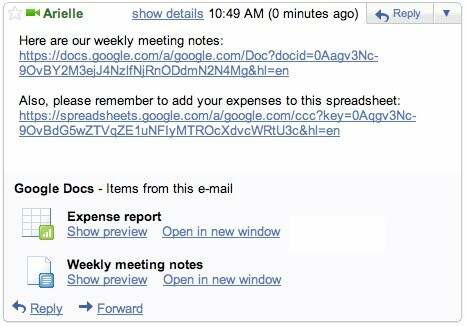 Gmail Labs has a new experiment that lets you preview documents, spreadsheets and presentations created using Google Docs. If you receive a message that links to a Google Docs file, you’ll be able to preview the document inside Gmail. “Opening these links in another tab or window is kind of annoying, plus it can be tough to keep the context of the email in mind while viewing the document,” mentions the Gmail Blog. Previews are displayed at the bottom of the message, so I don’t think you can maintain the context. Just click “Show preview” and the contents of the document will display right there — no need to switch back and forth between email response and document. To enable Google Docs previews, go to the Labs tab under Settings. Gmail has 5 other experimental features that let you preview YouTube videos, Picasa Web and Flickr photos, Yelp reviews and voicemails from Google Voice, but I think these previews would be more useful if they were displayed inline, like Yahoo Mail’s shortcuts or Interclue‘s tooltips. Copyright 2003 Emastech Sdn Bhd. All Rights Reserved.